The $1k Ladies event reached its conclusion on Day 34 of the 2011 WSOP. 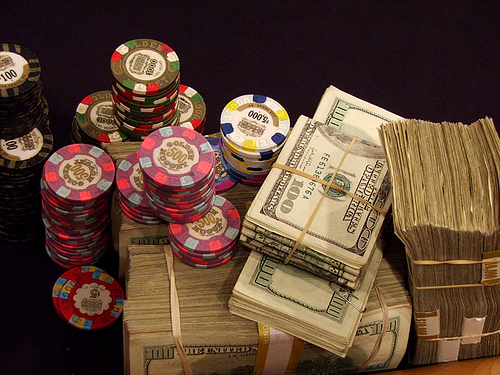 14 players returned to the tables on Day 3 of the event. The field included a male player too, who was among those who once again infiltrated the ladies’ event with hopes of easy pickings. Jonathan Epstein was the male player, who then proceeded to make the final table, thus becoming the first ever male to make the final table of a ladies’ WSOP event. Karina Jett, who used to play on PokerStars and Full Tilt Poker, was the only pro left in the field by the time the final table was reached. The chip leader was Carol Tomlinson, who managed to amass a stack of 851k chips. Epstein’s time in the lime-light was over almost as soon as the final table action kicked off: he was the first victim of the last stage of the action. Marsha Wolak was the one who earned massive cheers from the rail by bouncing Epstein. Epstein got it all-in on a Ad, Qd and earned a massive number of outs on the board against Wolak’s pocket 10s. Wolak managed to dodge all those outs though, and the ladies’ event was finally free of unwanted intruders. Marsha Wolak had begun the final table as one of the short-stacks, but she managed to chip up repeatedly and she made the 3-handed stage of the event. Then she bounced Carol Tomlinson in 3rd to set up the heads-up stage of the action. Wolak had a pretty sizeable lead at the beginning of the home stretch and that lead would be translated into victory on the very first hand of heads-up play. Both players got their stacks into the middle, on a flop of Qd,Jd,8c. Wolak had Q,9 for the top pair and Jett had a K,10 for the open ended straight draw. The turn and the river bricked out and a new Ladies’ Champion was crowned. Wolak picked up $192k for her efforts. Check out pokerforum.net for the community buzz on the latest WSOP antics.